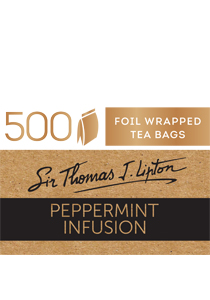 SIR THOMAS LIPTON is a distinctive range of premium tea from the world's most renowned tea regions. Each tea bag is in an individual foil envelope to ensure optimum quality, freshness & hygiene. This peppermint tea is a refreshing, caffeine-free blend that is perfect after meals. Other flavours to complete the range are English Breakfast, Earl Grey, Decaffeinated, Green Tea, Green Tea with Jasmine, Lemon and Chamomile and are also available in packs of 25s. Premium tea you can seriously afford. Premium tea sourced from the world's best tea regions. A clean and refreshing peppermint infusion ideal for after meal occasions.